People have been wearing masks in theatres since the time of the Romans. 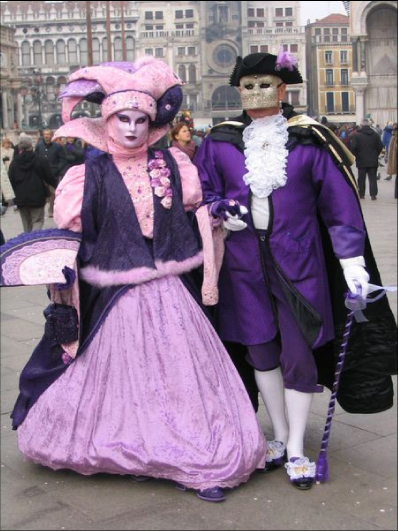 If the Venetian masks history has piqued your curiosity then visit us for all you need to know on this wonderful tradition. 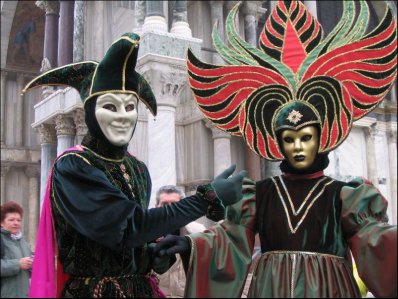 Carnevale Di Venezia was first recorded in 1268. 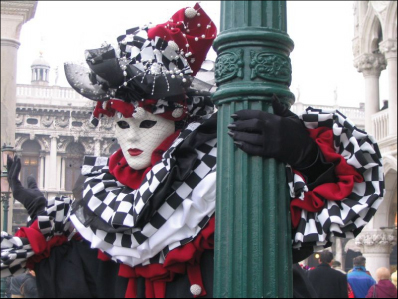 Masks have always been a central feature of the Venetian carnival; traditionally people were allowed to wear them between the festival of Santo Stefano (St. Stephen's Day, December 26) at the start of the carnival season and midnight of Shrove Tuesday. They have always been around Venice. As masks were also allowed during Ascension and from October 5 to Christmas, people could spend a large proportion of the year in disguise. 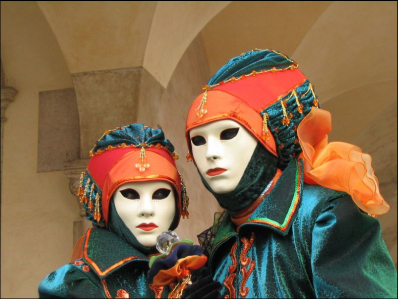 Maskmakers (mascherari) enjoyed a special position in society, with their own laws and their own guild. In 1797 Venice became part of the Austrian-held Kingdom of Lombardy-Venetia when Napoleon signed the Treaty of Campo Formio. The Austrians took control of the city on January 18, 1798 and it fell into a decline which also effectively brought carnival celebrations to a halt for almost two centuries. 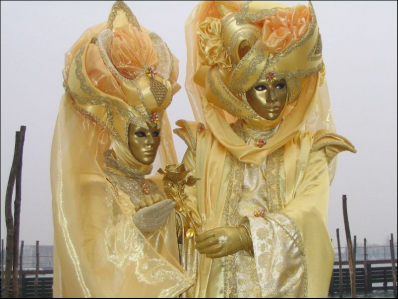 Carnival was outlawed by the fascist government in the 1930s. It was not until a modern mask shop was founded in the 1980s that Carnival enjoyed a revival. Carnival starts around two weeks before Ash Wednesday and ends on Shrove Tuesday (Fat Tuesday or Mardi Gras), the day before Ash Wednesday. 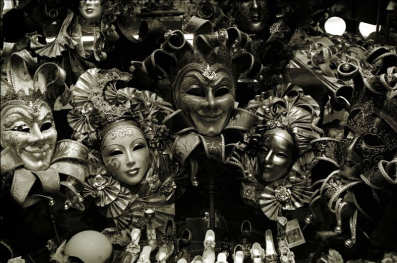 These luxury Venetian masks can be made in leather or with the original papier mâché technique. The original masks were rather simple in design and decoration. They often had a symbolic and practical function. Nowadays, most of them are made with the application of gesso and gold leaf and are all hand-painted using natural feathers and gems to decorate. Bauta full face Venetian masks are "mask which covers the whole face, with a stubborn chin line, no mouth, and lots of gilding". One may find masks sold as Bautas that cover only the upper part of the face from the forehead to the nose and upper cheeks, thereby concealing identity but enabling the wearer to talk and eat or drink easily. It tends to be the main type of mask worn during the Carnival. It was used also on many other occasions as a device for hiding the wearer's identity and social status. It would permit the wearer to act more freely in cases where he or she wanted to interact with other members of the society outside the bounds of identity and everyday convention. It was thus useful for a variety of purposes, some of them illicit or criminal, others just personal, such as romantic encounters. 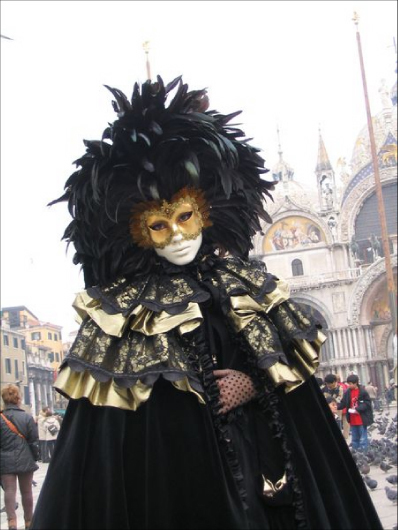 The moretta is an oval mask of black velvet that was usually worn by women visiting convents. It was invented in France and rapidly became popular in Venice as it brought out the beauty of feminine features. The mask was finished off with a veil. 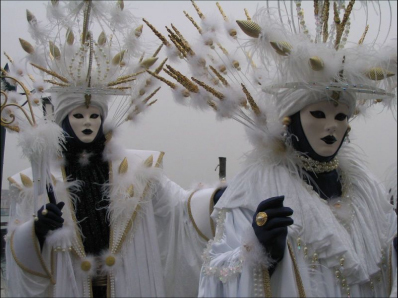 The larva, also called the volto mask, is mainly white, and typically Venetian. It is worn with a tricorn and cloak. It is thought the word "larva" comes from the Latin meaning "mask" or "ghost". It is easy to imagine the effect of a Venetian all dressed in black with a white mask and a black tricorn, going past in the moonlight. Like the bauta, the shape of the mask allowed the bearer to breathe and drink easily, and so there was no need to take it off, thus preserving anonymity. These masks were made of fine wax cloth and so were much lighter and were not irritating to wear making them ideal for eating, dancing and flirting. The mascherari, or mask-makers, from the days of Doge Foscari onwards, had their own statute dated 10 April 1436. They belonged to the fringe of painters and were helped in their task by sign-painters who drew faces onto plaster in a range of different shapes and paying extreme attention to detail.